Parts of graphics required to understand the content, except when a particular presentation of graphics is essential to the information being conveyed. The intent of this Success Criterion is to ensure that active user interface components (i.e., controls) and meaningful graphics are distinguishable by people with moderately low vision. The requirements and rationale are similar to those for large text in 1.4.3 Contrast (Minimum). Low contrast controls are more difficult to perceive, and may be completely missed by people with a visual impairment. Similarly, if a graphic is needed to understand the content or functionality of the webpage then it should be perceivable by people with low vision or other impairments without the need for contrast-enhancing assistive technology. For active controls such as buttons and form fields: any visual information provided that is necessary for a user to identify that a control is present and how to operate it must have a minimum 3:1 contrast ratio with the adjacent colors. Also, any visual information necessary to indicate state, such as whether a component is selected or focused must also ensure that the information used to identify the control in that state has a minimum 3:1 contrast ratio. This Success Criterion does not require that changes in color that differentiate between states of an individual component meet the 3:1 contrast ratio when they do not appear next to each other. For example, there is not a new requirement that visited links contrast with the default color, or that mouse hover indicators contrast with the default state. However, the component must not lose contrast with the adjacent colors, and non-text indicators such as the check in a checkbox, or an arrow graphic indicating a menu is selected or open must have sufficient contrast to the adjacent colors. This success criteria does not require that controls have a visual boundary indicating the hit area, but if the visual indicator of the control is the only way to identify the control, then that indicator must have sufficient contrast. If text (or an icon) within a button is visible and there is no visual indication of the hit area then the Success Criterion is passed. If a button with text also has a colored border, since the border does not provide the only indication there is no contrast requirement beyond the text contrast (1.4.3 Contrast (Minimum)). Note that for people with cognitive disabilities it is recommended to delineate the boundary of controls to aid in the recognition of controls and therefore the completion of activities. A button (active control) without a visual boundary, and the same button with a defined visual boundary. For user interface components 'adjacent colors' means the colors adjacent to the component. For example, if an input has a white internal background, dark border, and white external background the 'adjacent color' to the component would be the white external background. If the inner background of the component provides contrast with the adjacent background color, a border can be ignored for the purpose of contrast. For example, an input that has a light background on the inside of the field and a dark background around it, could have a dark or a light colored border. As the difference between backgrounds provides contrast, the border is not important for this success criterion. The contrast of the input background (white) and color adjacent to the control (dark blue) is sufficient. There is also a border (silver) on the component that is not required to contrast with either. For visual information required to identify a state, such as the check in a checkbox or the thumb of a slider, that part might be within the component so the adjacent color might be another part of the component. A customized checkbox with light grey check, which has a contrast ratio of 5.6:1 with the purple box. It is possible to use a flat design where the status indicator fills the component and does not contrast with the component, but does contrast with the colors adjacent to the component. The first radio button shows the default state, the second and third show the radio button selected, and filled with a color that contasts with the color adjacent to the component. The last example shows the state indicator contrasting with the component colors. The Use of Color success criterion addresses changing only the color (hue) of an object or text without otherwise altering the object's form. The principle is that contrast ratio (the difference in brightness) can be used to distinguish text or graphics. For example, G183: Using a contrast ratio of 3:1 with surrounding text and providing additional visual cues on focus for links or controls where color alone is used to identify them is a technique to use a contrast ratio of 3:1 with surrounding text to distinguish links and controls. In that case the Working Group regards a link color that meets the 3:1 contrast ratio relative to the non-linked text color as satisfying the Success Criteria 1.4.1 Use of color since it is relying on contrast ratio as well as color (hue) to convey that the text is a link. Non-text information within controls that uses a change of hue alone to convey the value or state of an input, such as a 1-5 star indicator with a black outline for each star filled with either yellow (full) or white (empty) is likely to fail the Use of color criteria rather than this one. 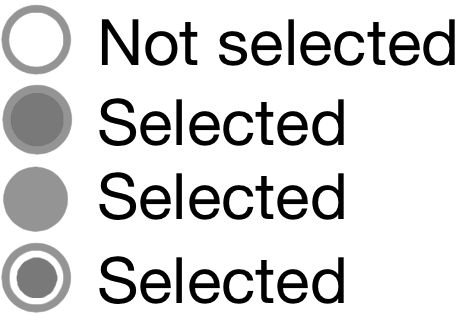 Two examples which pass this success criteria, using either a solid fill to indicate a checked-state that has contrast, or a thicker border as well as yellow fill. Two examples which fail a success criteria, the first fails the Use of color criteria due to relying on yellow and white hues. The second example fails the Non-text contrast criteria due to the yellow to white contrast ratio of 1.2:1. Using a change of contrast for focus and other states is a technique to differentiate the states. This is the basis for G195: Using an author-supplied, highly visible focus indicator, and more techniques are being added. In combination with 2.4.7 Focus Visible, the visual focus indicator for a component must have sufficient contrast against the adjacent background when the component is focused, except where the appearance of the component is determined by the user agent and not modified by the author. If the focus state relies on a change of color (e.g., changing only the background color of a button), then changing from one color to another that has at least a 3:1 contrast ratio with the previous state of the control is a method for meeting the Focus visible criteria. For designing focus indicators, selection indicators and user interface components that need to be perceived clearly, the following are examples that have sufficient contrast. Default link text is in the scope of 1.4.3 Contrast (Minimum), and the underline is sufficient to indicate the link. Links are required to have a focus indicator by 2.4.7 Focus Visible. Where the focus style of the user-agent is not adjusted on interactive controls (such as links, form fields or buttons), the default focus style is sufficient. Where links or buttons have an author-supplied style for the focus indicator, the focus indicator must meet the 3:1 contrast ratio. Where a text-input has a visual indicator that it is an input, such as a bottom border, that indicator must meet 3:1 contrast ratio. Where a text-input has an indicator, such as a complete border, that indicator it must meet 3:1 contrast ratio. A focus indicator is required. If the focus indicator is styled by the author, it must meet the 3:1 contrast ratio. Text inputs that have no border and are differentiated only by a background color must have a 3:1 contrast ratio to the adjacent background. Where an author-created focus style is applied to a control on a dark background, it must have 3:1 contrast with the adjacent dark background. User Interface Components that are not available for user interaction (e.g., a disabled control in HTML) are not required to meet contrast requirements in WCAG 2.1. An inactive user interface component is visible but not currently operable. An example would be a submit button at the bottom of a form that is visible but cannot be activated until all the required fields in the form are completed. Backward compatibility: WCAG 2.0 guidance for 1.4.3 Contrast (Minimum) specifically exempts text or images of text that are part of an inactive user interface component . It would be confusing and inconsistent to exempt text in inactive components from contrast considerations while requiring sufficient contrast for the graphical container the text resides in. Variations in significance: Depending on the circumstances, disabled controls may be intentionally designed to be more or less visible depending on how meaningful a control's disabled state is. Two examples can illustrate. A control remains disabled only until the user completes a prerequisite task, at which point it becomes active. A designer uses a standard layout for a number of operations. In one operation a control is not valid and so is disabled, but remains visible simply to maintain a consistent layout. The disabled control in the first example offers a more significant cue, and a designer may intentionally decrease the contrast in the second case to de-emphasize its importance. Conflicting needs and desires. Although meaningful information is conveyed by a lower-contrast disabled control (to those who can perceive it), not all users desire an increase in the prominence of disabled controls. Low-vision - some users want to ignore the disabled elements, just focusing on the enabled elements. Other low vision users want to see the disabled items clearly. Cognitive - some people with cognitive differences really want to be able to focus on the active elements (and ignore the non-active elements). If we force stronger contrast on the disabled elements, it will likely be difficult for all sighted people to distinguish what is active (and what is disabled). A one-size-fits-all solution has been very difficult to establish. A method of varying the presentation of disabled controls, such as adding an icon for disabled controls, based on user preferences is anticipated as an advancement in the future. The term "graphical object" applies to stand-alone icons such as a print icon (with no text), and the important parts of a more complex diagram such as each line in a graph. For simple graphics such as single-color icons the entire image is a graphical object. Images made up of multiple lines, colors and shapes will be made of multiple graphical objects, some of which are required for understanding. Not every graphical object needs to contrast with its surroundings - only those that are required for a user to understand what the graphic is conveying. Gestalt principles such as the "law of continuity" can be used to ignore minor overlaps with other graphical objects or colors. 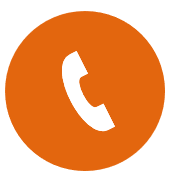 The phone icon is a simple shape within the orange circle. The meaning can be understood from that icon alone, the background behind the circle is irrelevant. The orange background and the white icon have a contrast ration greater than 3:1, which passes. The graphical object is the white phone icon. A magnet can be understood by the "U" shape with lighter colored tips. Therefore to understand this graphic you should be able to discern the overall shape (against the background) and the lighter colored tips (against the rest of the U shape and the background). The graphical objects are the "U" shape (by outline or by the solid red color), and each tip of the magnet. The low-currency symbol can be understood with recognition of the shape (down arrow) and the currency symbol (pound icon with the shape). To understand this graphic you need to discern the arrow shape against the white background, and the pound icon against the yellow background. The graphical objects are the shape and the currency symbol. In order to understand the graph you need to discern the lines and shapes for each condition. Therefore each line and colored shape is a ‘graphical object’ in the graph and should be over 3:1 against the white background. Most of them have good contrast except the green triangles. The graphical objects are the lines in the graph, including the background lines for the values, and the colored lines with shapes. To understand the pie chart you have to discern each slice of the pie chart from the others. 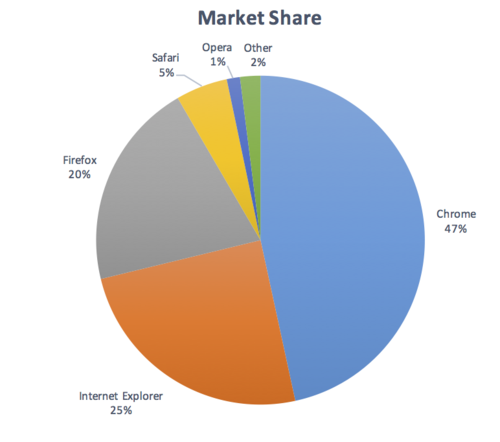 The graphical objects are the slices of the pie (chart). 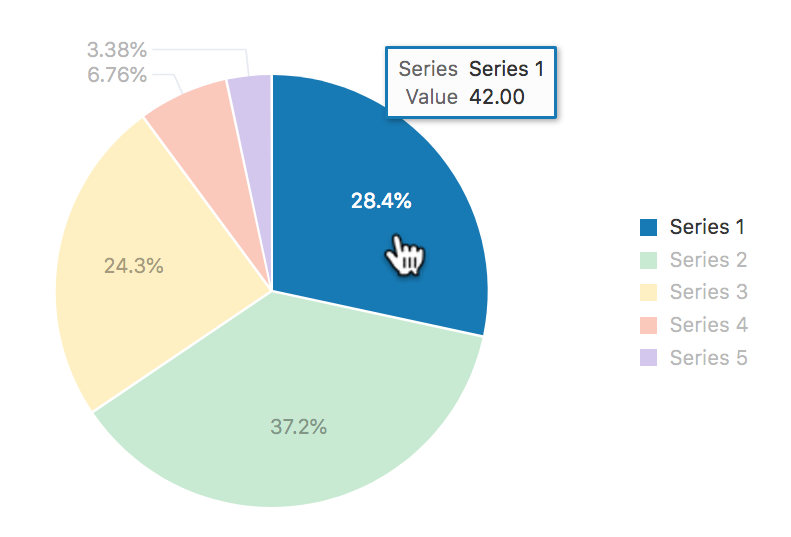 Note: If the values of the pie chart slices were also presented in a conforming manner (see the Pie Charts example for details), the slices would not be required for understanding. Assess what part of each image is needed to understand what it represents. The magnet's "U" shape can be conveyed by the outline or by the red background (either is acceptable). The white tips are also important (otherwise it would be a horseshoe), which needs to contrast with the red background. Assume that the user could only see those aspects. Do they contrast with the adjacent colors? The outline of the magnet contrasts with the surrounding text (black/white), and the red and white between the tips also has sufficient contrast. Due to the strong contrast of the red and white, it would also be possible to only put the outline around the white tips of the magnet and it would still conform. A graphic with text embedded or overlayed conveys the same information, such as labels and values on charts. The graphic is for aesthetic purposes that does not require the user to see or understand it to understand the content or use the functionality. The information is available in another form, such as in a table that follows the graph, which becomes visible when a "Long Description" button is pressed. The graphic is part of a logo or brand name (which is considered "essential" to its presentation). Gradients can reduce the apparent contrast between areas, and make it more difficult to test. The general principles is to identify the graphical object(s) required for understanding, and take the central color of that area. If you remove the adjacent color which does not have sufficient contrast, can you still identify and understand the graphical object? Removing the background which does not have sufficient contrast highlights that the graphical object (the "i") is not then understandable. Some graphics may have interactions that either vary the contrast, or display the information as text when you mouseover/tap/focus each graphical object. In order for someone to discern the graphics exist at all, there must be contrasting colors or text in order to find the graphics. Within that area, information available by a conforming method (e.g., focusable elements) can be used to make that information available dynamically as text, or dynamically increase the contrast. Infographics can mean any graphic conveying data, such as a chart or diagram. On the web it is often used to indicate a large graphic with lots of statements, pictures, charts or other ways of conveying data. In the context of graphics contrast, each item within such an infographic should be treated as a set of graphical objects, regardless of whether it is in one file or separate files. An infographic can use text which meets the other criteria to minimise the number of graphical objects required for understanding. For example, using text with sufficient contrast to provide the values in a chart. A long description would also be sufficient because then the infograph is not relied upon for understanding. Logotypes and flags: The brand logo of an organization or product is the representation of that organization and therefore exempt. Flags may not be identifiable if the colors are changed to have sufficient contrast. Sensory: There is no requirement to change pictures of real life scenes such as photos of people or scenery. Screenshots to demonstrate how a website appeared. Diagrams of medical information that use the colors found in biology (example medical schematic from Wikipedia). color gradients that represent a measurement, such as heat maps (example heatmap from Wikipedia). Identify the visual (non-text) indicators of the component that are required to identify that a control exists, and indicate the current state. In the default (on page load) state, test the contrast ratio against the adjacent colors. Test those contrast indicators in each state. If the least-contrasting area is less than 3:1, assume that area is invisible, is the graphical object still understandable? If there is enough of the graphical object to understand, it passes, else fail. The techniques below each have testing criteria, and the related criteria for Focus visible (2.4.7), Use of color (1.4.1), and Contrast minimum also have techniques. People with low vision often have difficulty perceiving graphics that have insufficient contrast. This can be exacerbated if the person has a color vision deficiency that lowers the contrast even further. Providing a relative luminance (lightness difference) of 3:1 or greater can make these items more distinguishable when the person does not see a full range of colors. Status icons on an application's dashboard (without associated text) have a 3:1 minimum contrast ratio. A text input has a dark border around the white editable area. A graph uses a light background and ensures that the colors for each line have a 3:1 contrast ratio against the background. 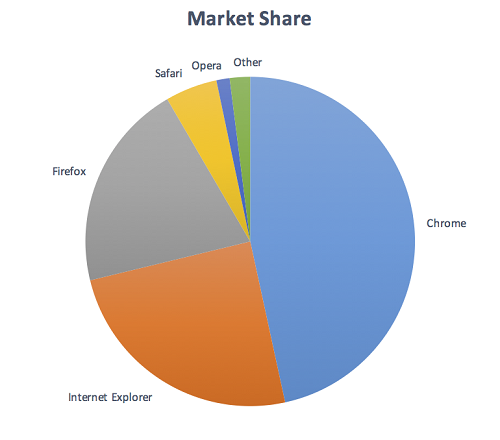 Pie charts make a good case study for the graphical objects part of this success criteria, the following pie charts are intended to convey the proportion of market share each browser has. Please Note: The actual figures are made up, these are not actual market shares. Fail: The pie chart has labels for each slice (so passes 1.4.1 Use of Color), but in order to understand the proportions of the slices you must discern the edges of the slices (the graphical objects conveying essential information), and the contrast between the slices is not 3:1 or greater. Not applicable: The pie chart has visible labels and values that convey equivalent information to the graphical objects (the pie slices). 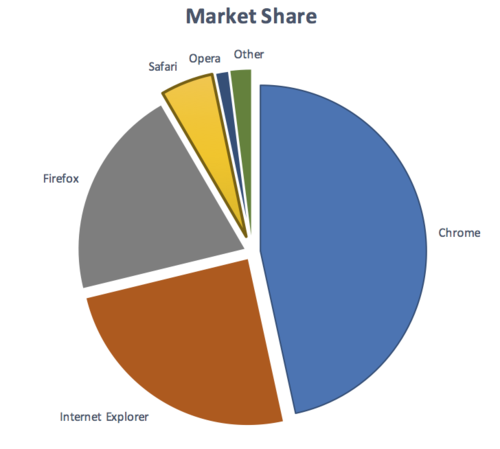 Pass: The pie chart has visible labels, and sufficient contrast around and between the slices of the pie chart (the graphical objects). A darker border has been added around the yellow slice in order to achieve the contrast level. Fail: Discerning the circles is required to understand the size of network and discerning the icons in each circle is required to identify which network it shows. The graphical objects are the circles (measured against the background) and the icons in each circle (measured against the circle's background). Pass: The circles have contrasting borders and the icons are a contrasting dark color against the light circle backgrounds. There are many possible solutions to ensuring contrast, the example shows the use of borders. Other techniques are to use darker colors for the circle backgrounds, or to add text labels & values for each item. Accessibility Requirements for People with Low Vision. Smith Kettlewell Eye Research Institute - "If the text is better understood with the graphics, they should be equally visible as the text". Gordon Legge - "Contrast requirements for form controls should be equivalent to contrast requirements for text". Select the situation below that matches your content. Each situation includes techniques or combinations of techniques that are known and documented to be sufficient for that situation. The following are common mistakes that are considered failures of this Success Criterion by the WCAG Working Group. L2 is the relative luminance of the darker of the colors. Contrast ratios can range from 1 to 21 (commonly written 1:1 to 21:1). Because authors do not have control over user settings as to how text is rendered (for example font smoothing or anti-aliasing), the contrast ratio for text can be evaluated with anti-aliasing turned off. For the purpose of Success Criteria 1.4.3 and 1.4.6, contrast is measured with respect to the specified background over which the text is rendered in normal usage. If no background color is specified, then white is assumed. Background color is the specified color of content over which the text is to be rendered in normal usage. It is a failure if no background color is specified when the text color is specified, because the user's default background color is unknown and cannot be evaluated for sufficient contrast. For the same reason, it is a failure if no text color is specified when a background color is specified. When there is a border around the letter, the border can add contrast and would be used in calculating the contrast between the letter and its background. A narrow border around the letter would be used as the letter. A wide border around the letter that fills in the inner details of the letters acts as a halo and would be considered background. WCAG conformance should be evaluated for color pairs specified in the content that an author would expect to appear adjacent in typical presentation. Authors need not consider unusual presentations, such as color changes made by the user agent, except where caused by authors' code. States do not affect the nature of the component, but represent data associated with the component or user interaction possibilities. Examples include focus, hover, select, press, check, visited/unvisited, and expand/collapse. Multiple user interface components may be implemented as a single programmatic element. Components here is not tied to programming techniques, but rather to what the user perceives as separate controls. User interface components include form elements and links as well as components generated by scripts. What is meant by "component" or "user interface component" here is also sometimes called "user interface element". An applet has a "control" that can be used to move through content by line or page or random access. Since each of these would need to have a name and be settable independently, they would each be a "user interface component."